VDV Works offers tech support for the voice-data-video (VDV) communications industry. We lecture, teach and consult on fiber optics and communications, create and license training curriculum used for teaching fiber optics and structured cabling and manage the Fiber Optic Association (FOA). Voice, data and video covers a lot of territory: telephones including wireless, the Internet, LANs (local area networks), OLANs (Optical LANs), SANs (storage area networks), CATV and CCTV, security and even fiber optic networks in vehicles (MOST). We're a husband (Jim Hayes) and wife (Karen Hayes) team with 35+ years of experience in communications, specializing in fiber optics and structured cabling. Our many years as successful entrepreneurs,including running Fotec, the fiber optic test equipment company we sold to Fluke Networks in 2001, has given us in-depth sensitivity to most business issues, including marketing, R&D, engineering, PR/advertising and manufacturing. In addition, Karen's background includes public affairs and consulting on AT&T's divestiture in the early 80s and Jim has many years in semiconductors and instrumentation. This gives us familiarity with many networking technologies and applications and allows us to provide technical and marketing assistance that leads to market success, teaches effectively, creates the right kind of image for your organization and helps you support your customers properly. In 1995, we co-founded the Fiber Optic Association, Inc. with the instructors and supporters of Fotec's Fiber U Training Conference. We had been training fiber techs since 1982 and training trainers to teach others. Since the beginning we have been involved in the FOA from both technical and operations sides and have been running the organization under contract for the last 15 years. Our broad base of experience has allowed us to help a wide variety of clients in a number of unique ways. We manage the operations of The FOA (Fiber Optic Association, Inc.), the professional society of fiber optics, including administering the FOA's certification programs, standards activities, creation of training curriculum, editing and publishing textbooks (e.g. The FOA Reference Guide to Fiber Optics and the Fiber Optic Technicians Manual textbooks and NECA-301 installation standard) and maintaining the FOA website. We have consulted with manufacturing organizations -large and small- to review their product offerings and provide assistance in developing products, specifying the products according to industry standards, developing marketing programs and strategies, developing customer training programs and training company personnel. We have consulted with investment groups on markets and technology. We have consulted with large training organizations to develop communications training programs, both basic and advanced, that have been enthusiastically accepted by commercial and military customers. We have done technical consulting on new produces and patents. If you have a problem in fiber optics or VDV cabling, call us to discuss it. If we can't help, we probably know someone who can. Through The FOA we coordinate with FOA Master Instructors worldwide to develop training curriculum for students and instructors and self-study programs for technicians/installers available through the website of The Fiber Optic Association. Our experience in training is extensive, including training over ten thousand students in person and hundreds of thousands through our online training (since 1997, the first in the industry.) Our "Fiber U" and "Cable U" programs were known worldwide and Jim was named one of fiber optics' "Luminaries" by Fiberoptic Product News magazine for his contributions to the industry through training and recognized by BroadBand Properties magazine as one of the "Pioneers in FTTH" for his education and recruitment activities. 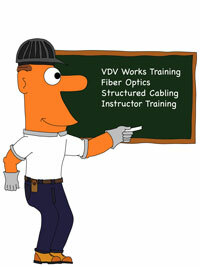 VDV Works offers two free online tutorials for those getting started in fiber optics or structured cabling. These websites have been used by more techs to get started than any other website or publication because they are the best overviews of the technologies available anywhere! Feel free to link to these guides from your website. In addition, the FOA offers free online self-study programs at Fiber U. See the links at the left to see what VDV works can offer to you or contact us.